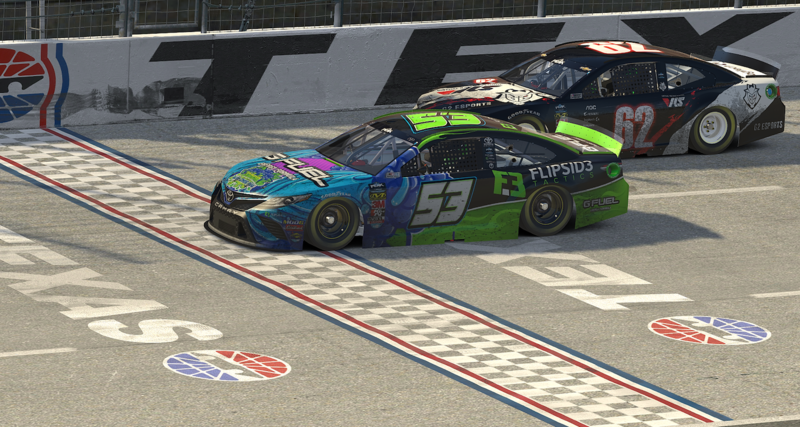 Ryan Luza won his second eNASCAR PEAK Antifreeze iRacing Series race in 2019, narrowly beating Keegan Leahy in a one-lap shootout at Texas Motor Speedway. The 2017 series champion got the jump on the final restart and used the inside to his advantage, narrowly holding off Leahy by .055 seconds as others tangled coming to the checkers. Renegades teammates Corey Vincent and Garrett Lowe finished third and fourth, respectively, with pole-sitter Michael Conti rallying for a fifth-place result. Ryan Luza edges Keegan Leahy to the line by 0.055 seconds. Luza, who paced the field for 98 of 167 laps, was out front seemingly headed to victory when a late caution flew with 11 laps to go. The caution sent the lead-lap cars to pit road for tires with Luza’s crew holding serve during the stop. Another quick caution after the restart set up the one-lap shootout between Luza and G2 eSports’ Leahy. The win increased Luza’s points lead to 10 markers over Leahy, who kept his top-five streak intact through four races. With his first top-five of 2019, Conti is now third in the standings, 27 points back of the lead. He is closely followed by Richmond Raceway eSports driver Jimmy Mullis and Roush Fenway’s Zack Novak. Still notably absent from playoff eligibility is Ray Alfalla, who continues to struggle early in the season. The four-time champion is without a top-five finish and sits 11th in the standings. The series heads to Richmond Raceway next for the first short track showdown of 2019. This will also be the first test of the new short track rules package, featuring the same high downforce of the bigger tracks and 200 additional horsepower. Catch the action Tuesday, April 9th at 9pm ET on eNASCAR.com and twitch.tv/iracing.